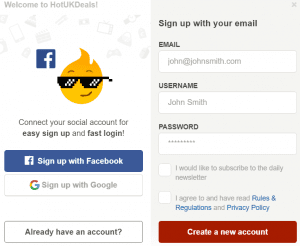 What is HOTUKDEALS: A Deal Breaker or a Deal Winner? What is HotUKdeals; in a nutshell, this is where members of the community help each other find great deals that they come across whilst surfing the net! Looking for a great deal then check out HotUKDeals first, you never know it could save you a lot of time. I don’t know about you but I love great bargains, but sometimes finding them takes a lot of research, but how cool would it be if someone had already found that great deal you have been spending hours looking for? We are all searching for ways to get a little extra help when shopping online, especially when the internet today is where we tend to do all our shopping, right? 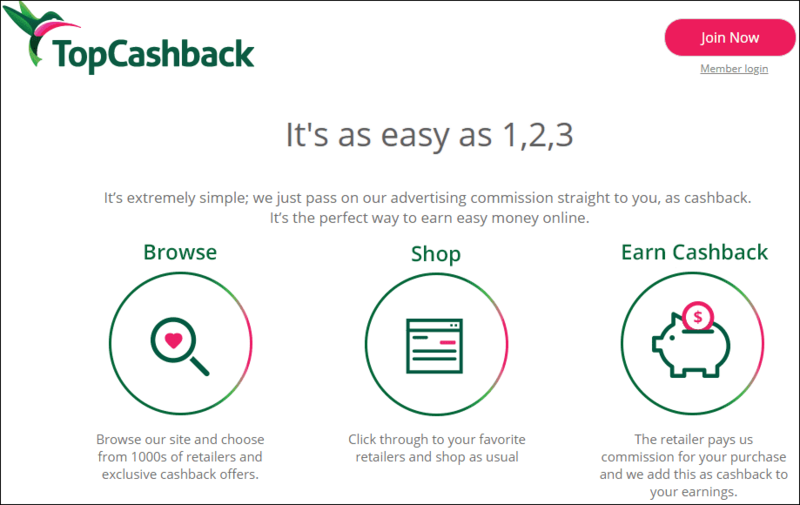 I guess you have spent many hours checking out those Cashback/Reward sites or have you had enough or are you just looking for something a little different, then you are in the right place. You the members are in control here where helping each other finding those great deals goes a long way! Summary: Where members discover internet bargains and share them with the community. How Does HotUKDeals make Money? What is HotUKDeals – Final thoughts! Currently over 2.4 million members. Over 1.9 million deals created. Over 3.2 million followers on Facebook. The leading deals platform in the UK where you the consumer are in control. Another consumer saving site brought to you by Paul Nickel, the same person who is responsible for that other popular UK Cashback site Quidco. Founded way back in 2004 so you would think comes with some credence, right? Although HotUKDeals and Quidco have similarities in as much as they both help you save money and with Quidco a little cash too. The main difference is that Quidco brings the retailers and offers to you, whilst you (the member) help bring the deals and offers to the HotUKDeals community, and of course, no waiting 90 days for cash back to arrive in your bank account either. HUKD is part of the Pepper.com group, which is the world’s largest shopping deals community, covering 14 countries across 4 continents and used by 25+ million members each month influencing thousands of purchasing decisions every minute. A place where you the consumer are in control! Those great deals are out there, you just need to find them, well the purpose of this site is to bring those deals, vouchers and other consumer info, and share them amongst the HotUKDeals community. Here those deals can be discussed amongst the members by sharing their experiences and giving their honest opinions. The idea behind the site is to help you the consumer get away from the marketing hype with popups and emails we are bombarded with in everyday life, and to get genuine honest advice from members about (hot or cold) deals. By doing this you are in control of the deals pushing them into the “Hot” or “Cold” positions. Retailers love their products pushed into a “Hot” position because it helps them sell more of that product, on the other hand, a “Cold” deal would be frowned upon and that is something the retailer does not want to see. Whilst a “Cold” deal is bad for the retailer, it can be good for the consumer because the retailer will become aware of this and this could help drive the price down or some other added benefit. Of course, you don’t have to go out and find those great deals to share with the community as there is an abundance of deals already available, but if you do see something that you think others might be interested in, then show some love. Remember giving is much better than taking! HotUKDeals like most other sites similar work in the Affiliate Marketing domain, where normally they would get paid by the retailer for displaying offers and websites on their site. They normally would be paid for Pay Per Click (PPC) advertising which means that HotUKDeals would get paid by the retailer for the member just clicking on a retailer’s offer or website where a product purchase doesn’t need to happen. It doesn’t seem to be set in concrete just how HotUKDeals actual gets paid because I can’t find anything online stating this. Most deals submitted to the HotUKDeals site tend to have an affiliate link attached and according to HUKD that is the only way they get paid. That implies that they get paid for some product deals and not others, which in my eyes is not a way to run a profitable business. All that is required is a valid email address, user-name and password. Other options are to sign up using your current Facebook or Google account, but I would refrain from using those accounts. I mean, do you really want family and friends to know what you are up to? I would also check and subscribe to the newsletter and be kept abreast of all the new deals and offers that are being added. Of course, you also need to read the rules and regulations too. Communicating with other members of the forum is a major part of how this site operates, and HotUKDeals are very strict in how you conduct yourself, and therefore I would check out the code of conduct rules first. Don’t forget to get hold of the HotUKDeals mobile app for when you are out and about. Your personal access to great deals, vouchers, freebies and a host of other great things. Installed by 30,000 members giving it a near perfect score rating. All you need to do now is search your favourite brands in the search bar or click on the drop-down menu’s. Remember, find a great deal anywhere online then don’t forget to share it with the community! Some Suggestions to Get the Best out of HotUKDeals! The site is literally crawling with great deals. A little helping hand to set you on your way. It pays to not be too comfortable with handing over your credit card details. If you don’t recognize the retailer then a quick Google search should give you some piece of mind, and save you what could be a load of hassle! Why not check out the competitions that are constantly being updated. They are free to enter. Members are always adding some great deals and offers in the miscellaneous section and many are free too. This is where all the discussions take place regarding deals and all the great advice to help you find that bargain of a life. Tell me that you don’t love freebies and I will eat my hat if, in fact, I had one! 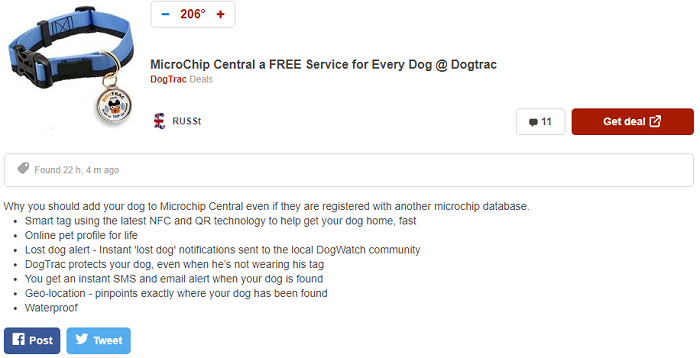 Just checked this minute and there are well over 600 freebies, such as free breakfasts at Morrisons, games, and even get yourself a free smart tag for your dog and registration to microchip central. Don’t forget to mark the 4th Friday of November in your diary, and see what great Black Friday bargains are on offer, especially with it coming up to the start of Christmas shopping. Both online and in-store. Find some amazing deals on computers, tv’s, clothing and much more. Don’t forget to check in on Cyber Monday which is only a few days after Black Friday and only for 1 day with some massive deals across many popular brands. With Black Friday and Cyber Monday very close together, you could save yourself a fortune on Christmas presents! Have you ever been to one of those high street stores when they have had a massive sales day, where hundreds of customers have camped outside hoping to bag that bargain of the century? 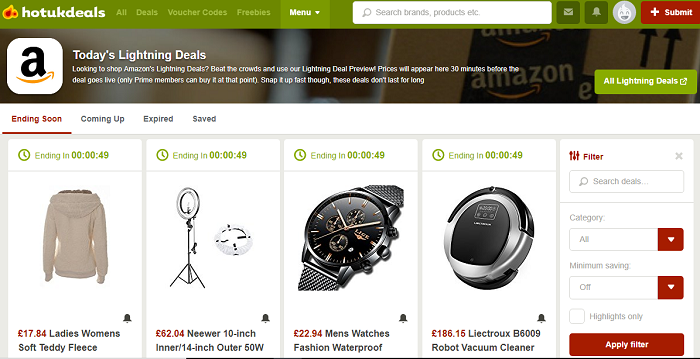 Well, how about getting in first to Amazon’s lightning deals before the Amazon crowd does, but be quick because the deals are only showcased on HotUKDeals for 30 minutes before the mad rush, so get your skates on. The only catch to grabbing that bargain before the mad rush is that you have to be an Amazon Prime Member. No problem though, most of us already are! How to Create a Deal Amongst other Things? What drives this business is the community and an eye for a bargain, and the fact that they want to share the deal amongst the other members. Without your input then the site wouldn’t function! Out there shopping on the internet and researching products and see a great bargain then share it amongst the community. Deal – Share that great bargain you came across whilst searching for something on the Internet. WOW! Like a new Nissan Qashqai! 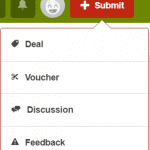 Voucher – Any bargain vouchers that you come across just let the community know about. Like a saving of around £40 on an adult ticket at Flamingo Land! Discussion – Create a new thread within the forum. Feedback – Let the site know about any issues you may have. As with all businesses whether online or not have their fair share of complaints, and whilst here at HUKD, there isn’t really much to shout about. Check out the Freebies, you are sure to find something you like. Get in first before Amazon users with the lightning deals. Some members have lost money by not checking out the retailers before purchasing. If you don’t know a retailer check them out first! I must admit that when I first came across HotUKDeals I thought it was some sort of gimmicky site, with little credibility, but since joining and reviewing this business, I can see a very worthy site that you should maybe consider. Straight off the bat, I found some great deals as well as some brilliant freebies along with some very useful voucher deals. All in the space of 10 minutes of joining. Affiliate marketing is the domain they operate in, which is a very straightforward business model and if you ever wish to turn the tables and be the one earning, as opposed to letting these sites earn from your participation, then why not check out this article I wrote explaining how it is done. Any questions don’t hesitate to ask! Are you a member of HotUKDeals? What do you think? Are you happy with the service? Found any great deals? Maybe you are thinking of joining? What did you think of the review and did it deliver? Love to hear your thoughts. I welcome all comments and will reply to them all. Author MickPosted on June 4, 2018 June 6, 2018 Categories Deals, Recommended6 Comments on What is HOTUKDEALS: A Deal Breaker or a Deal Winner? What is SwagBucks about? Is it LEGIT and is it WORTH it? Looking for a way to earn a little cash and you heard about Swagbucks. OK, so what is Swagbucks about, is it legit and can you really make some money on this site, but more importantly, is it really worth investing your time and energy? I’m sure you’ll agree that there are a vast number of opportunities on the internet with various claims. 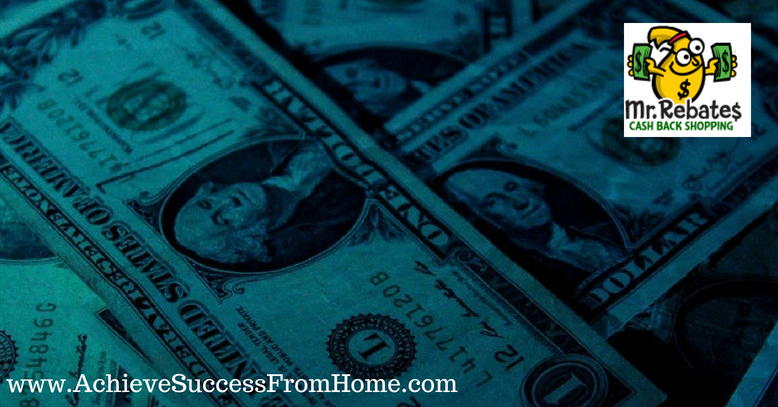 Promises of instant wealth or that making money online was easy to do. I’m sure you’ve come across them all! 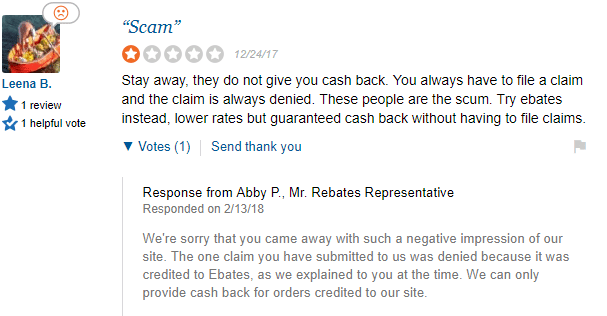 Well ignore those claims for the time being and let’s see whether Swagbucks .com can deliver or not! If taking part in surveys, playing games, watching videos, or discovering deals is something that interests you, then why not get paid for it? In this review I’m going to show; what is Swagbucks about, how it works, how much you can get paid and whether it really is something worthy of spending your time doing. Summary: Is a search engine, and allows you to participate in certain activities including online surveys where you are rewarded with a virtual currency. Recommended: YES – If you are ok about earning a few bucks here and there, but for me nowadays I have better things to do with my precious time. One of the fastest growing companies in the US. Is the leading digital rewards and performance marketing platform. Celebrities like Kanya West and Kiss are known to use the site. Music companies are now turning to branded search engine sites to reach their fans online. One of the largest survey sites and paid out among the most of its competitors. Over 20,000,000 members can’t be wrong. Can cash out for as little as $5 where most others are a lot more. Have a stream of awards – check out Wikipedia. Introduction of mobile apps for IOS and Android. Mobile app – SwagBucks TV feature. Mobile app – SwagBucks Answer specifically for survey taking. 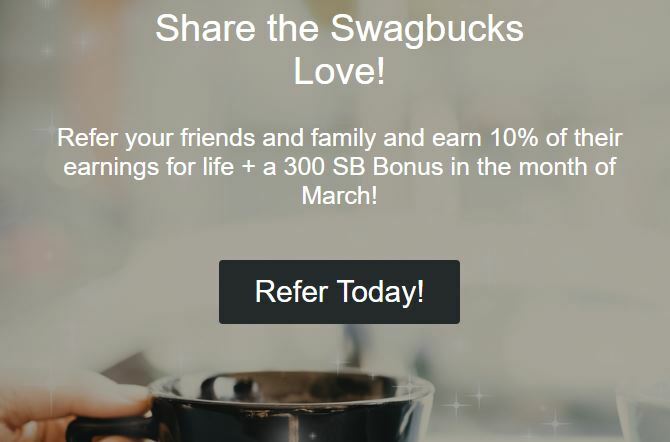 Swagbucks is one of the most legit survey sites that you will find on the Internet, who offer a wide range of money-making opportunities to earn rewards by way of Swagbucks (“SB”), from surfing the net, watching videos, playing games to filling in surveys, but it may not be for everyone. What is Swagbucks about, is it legit and can you really make some money? Let’s take a look, shall we? I first came across Swagbucks.com, through social media and Facebook and was curious about its claims, and therefore decided to check it out. Strange, but hey it’s catchy all the same, unique and hard to forget! 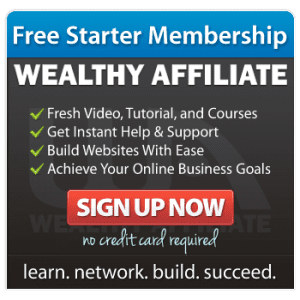 The website at first glance looked a little busy and confusing but after a few minutes (and that’s all it takes) I saw what it had to offer and found that maybe it could be a legit site and that you could make money from it. Just how much we are going to find out! Swagbucks is a website who are owned and operated by the company Prodege, who is a provider of digital services including online rewards and loyalty portals which Swagbucks is. Swagbucks is an online marketing website that gets paid by their clients (advertisers) for displaying their adds on their website, and where users like yourself get rewarded in the way of credits or digital currency identified as Swagbucks (“SB”) for participating in their online activities, such as taking surveys, watching videos and playing games, or simply for performing searches on their own search engine. You must agree that as we are always on the internet purchasing products and services then why not be rewarded for doing so? Could be a nice little earner! By accumulating rewards in the way of Swagbucks (“SB”), which is a virtual currency which you can use for shopping online at your favourite retailers. 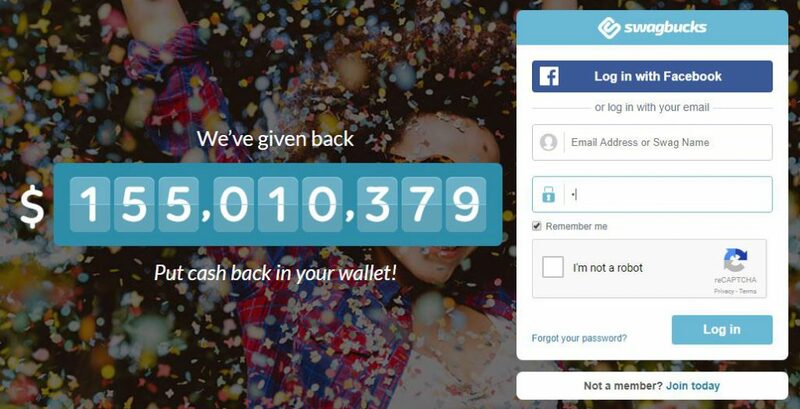 Once you have accumulated your Swagbucks(“SB”) then you are allowed to redeem them in the way of gift cards for the many retailers including PayPal which you can redeem for cash. Does Swagbucks have any Credibility? 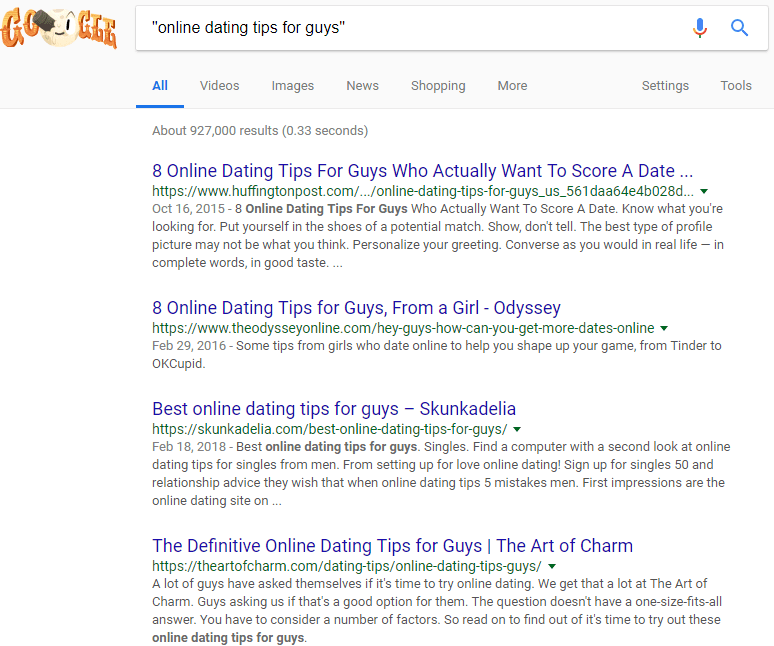 Well, they do have their own search engine that you can be rewarded just for using as your main search engine, and the site is actually sponsored by Google, so it comes with a certain amount of credibility, right? First off you need to register your account with them which is pretty straightforward, and don’t forget that Swagbucks.com is only available in certain countries. As of when this article was published the countries that Swagbucks is available, and has a presence in, is, USA(and its territories), Ireland, France, Germany, Australia, New Zealand, India, Canada, Spain, Portugal, and United Kingdom. This may have changed in the meantime and you can check this here. The way this works is that you choose an activity to participate in, such as taking surveys, watching videos, playing games and you are rewarded for doing so by way of “SB”, their virtual currency. By using the advertisers’ sites and purchasing products and services, you are rewarded with discounts, cash back, in the way of “SB”. We all use Google, Bing, and Yahoo and we don’t get rewarded for searching either, right? So, why not make the built-in search engine your default search engine and get rewarded for all your searches? We all like watching videos don’t we? These might not be your usual YouTube fun type videos but it all matters, and adds to that rewards total. Mind you some videos are anywhere from a few minutes all the way up to around 25 so maybe put one on and make yourself a coffee. It’s a way for advertisers to get people to watch their clips. I love games, well the older ones, but I don’t think you are going to find games like, Warhammer, World of Warcraft, Minecraft, or Doom here. If surveys are your forte, then that’s great except just like the videos they can take anything from a few minutes to over 20 and a little mind-numbing. Check out the numerous amount of deals that are displayed. Ranging from purchasing food, having a bet on the gee-gees to finding your next partner on a dating site. Just click on the link to discover new videos and articles that are currently trending on the Internet. Choose one of the options and work your way through the list. A close friend or family members birthday coming up or an anniversary, then check out the abundance of gift cards, such as Amazon, Wine and country gift baskets, Spa and wellness etc. Reward yourself with redeemable points. I think you’ll appreciate there is a little going on here and I can see that a lot of thought has gone into the website and that it is so well-thought-out, I just wonder whether spending your precious time in this manner is a worthy way to spend your day? As you accumulate the SwagBucks virtual currency through the activities you have taken part in, you can redeem them for a variety of gift cards. 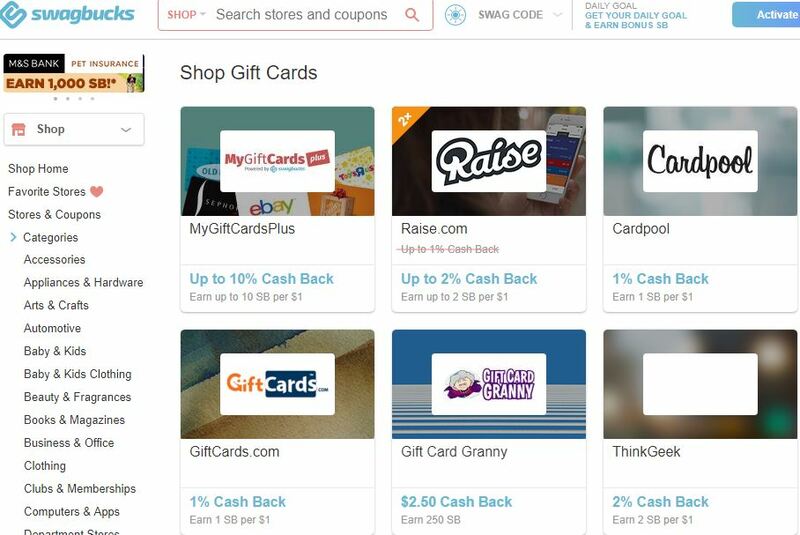 There is a multitude of gift cards you can purchase along with PayPal gifts cards that you would need to purchase if you intended redeeming the SwagBucks as cash. Definitely a legit work from home opportunity. If participating in watching videos, playing games or taking surveys and getting rewarded with cash is your thing then great. If you are one of the many who purchases products online then why not get rewarded for doing so. Who rewards you for using their search engine? Swagbucks does for one! 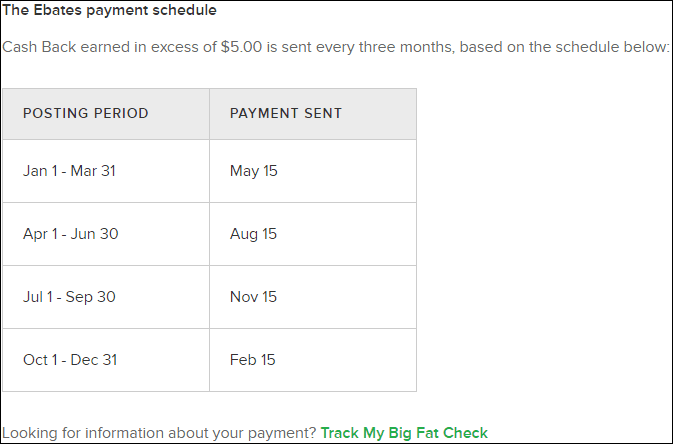 Accumulating Swagbucks rewards takes a lot of time and is painstakingly laborious, especially when taking the numerous surveys that are on offer. In some cases as long as 30 minutes for just a few Swagbucks. I guess the big question is do you really want to spend a lot of your precious time for a very little reward. 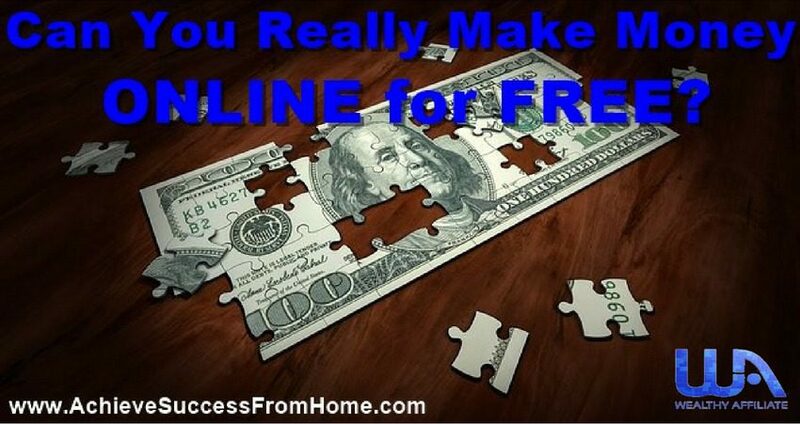 OK, so you found a money making website with all the added benefits all in one place and the great thing about this is that it’s 100% FREE! I’m sure you’ll agree that Swagbucks.com is, in fact, a legit website offering cash rewards, but you ain’t going to be making any “Big-Bucks”, any day soon using this website. 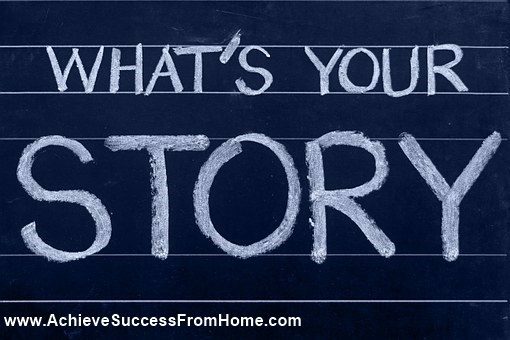 As we’ve seen, yes, you can make a little money but it’s not going to help you pay your gas and electricity bills, and certainly won’t get you into a position to tell your boss that you are calling it a day, or put you in a position to purchase your next brand new Audi. Set that aside and if you are OK about making just a few bucks here and there, then I suppose then it is OK, but don’t think for one moment that you are going to be rewarded with great amounts of cash because you won’t. Maybe your thing is taking surveys and if it is then that’s OK, but they aren’t fun at all! I should know I have tried a few!! 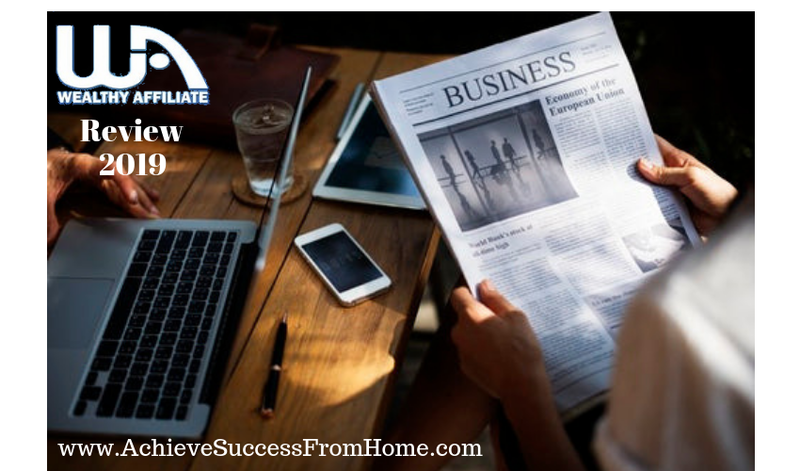 There are more practical alternative solutions out there where you can focus and use your time more efficiently to make money online. 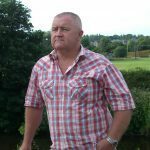 If “making money online” is your desire then why not check out what I do for a living. The training is very straightforward, as a massive community ready and willing to help and it will not break the bank. You can check it out here and one important factor and that is you ain’t going to be taking Surveys! Obviously, you can’t make a living on this site and I wouldn’t suggest that you try, but if you have worked out how to make some “Big-Bucks” then please let me know because I would very interested. Are you a member of Swagbucks.com and are you happy? Are you a member of any other survey type sites? What’s your overall impression of survey sites? 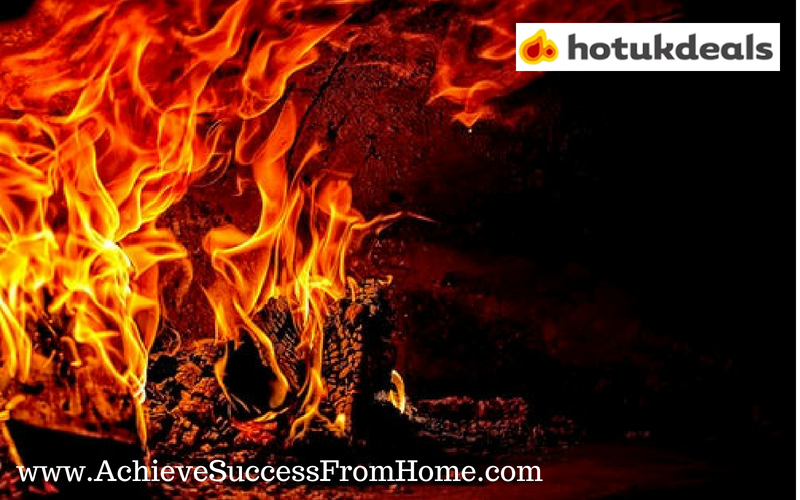 Are you looking for an alternative way to make money online? How about me showing you one? I’d love to hear any comments you have, and tell me what you thought about this review? I reply to all comments so let’s make that connection! 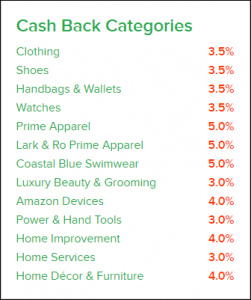 Author MickPosted on March 30, 2018 August 26, 2018 Categories Cashback Site, Recommended, Rewards Site4 Comments on What is SwagBucks about? Is it LEGIT and is it WORTH it? 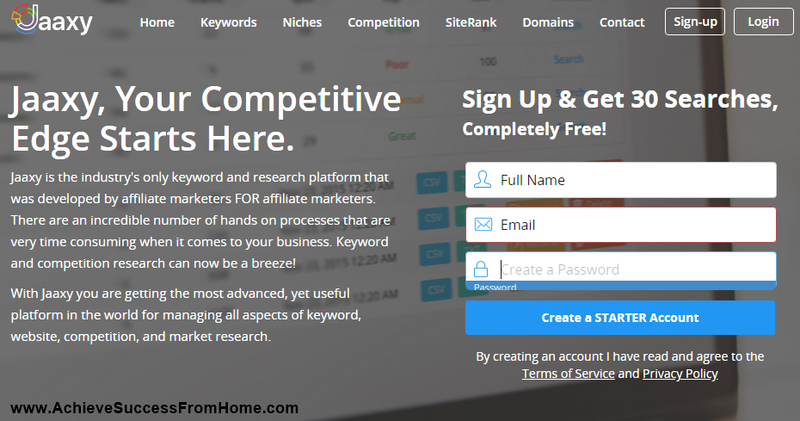 What’s the Best Keyword Research Tool for SEO that you can find in the Online Market Today? Is it Jaaxy? 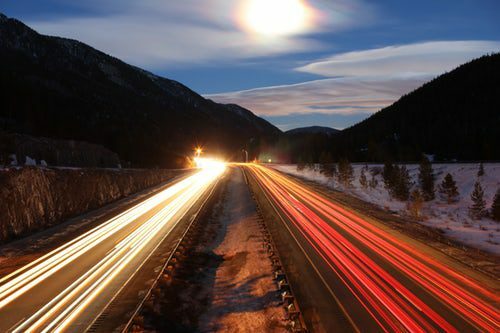 Check out a tool that highlights and simplifies the most popular searches that your target audience are making, and take your TRAFFIC to greater heights. 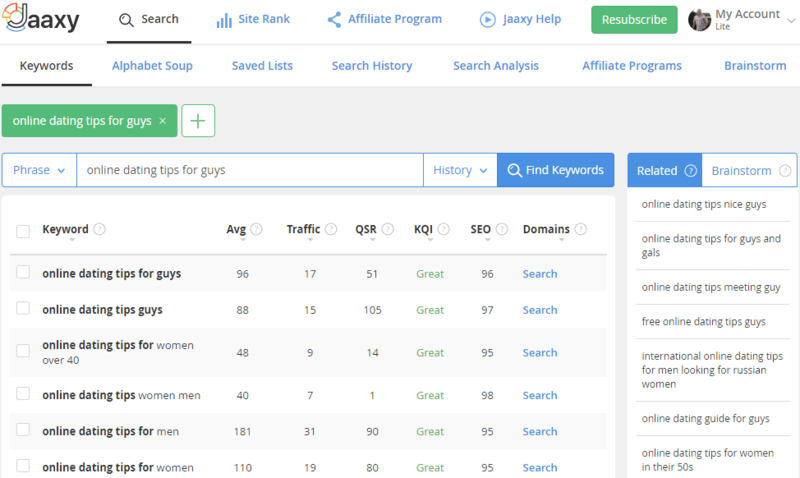 Welcome to what’s the best keyword research tool for SEO and when it comes to functionality, simplicity, speed, accuracy and cost, Jaaxy is streaks ahead of the rest. Don’t take my word for it, see for yourself! When building a website, keyword research is essential when seeking out what people are searching for in search engines like Google, Bing etc. 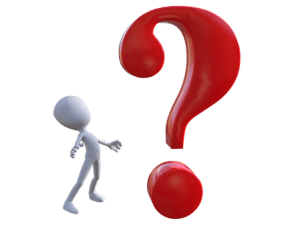 With around 6 billion “keyword” searches keyed into Google alone on a daily basis, how are you going to find out which “keywords” to use and which ones to not use if you don’t have the right tool for the job? You simply can’t! It doesn’t matter how acquainted you are with your niche, a keyword research tool will help to find those great keywords, not to mention the thousands of new keyword phrases that are being keyed into search engines on a day to day basis, that are related to your niche. Understanding what’s the best keyword research tool for SEO is imperative when searching out exact keyword phrases that your audience are using and for driving tons of traffic to your site. 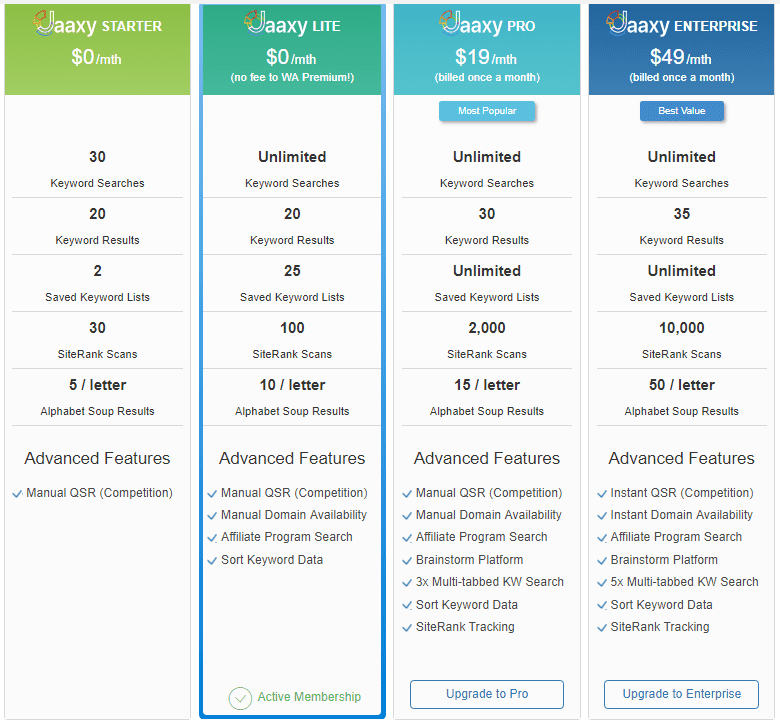 In this Jaaxy keyword research tool review, I would like to show you why I think that Jaaxy is the best tool for the job, and will go into great detail, covering all the key features that make Jaaxy stand out above the rest. Jaaxy is brought to you by the same guys responsible and who co-founded Wealthy Affiliate, Kyle and Carson. 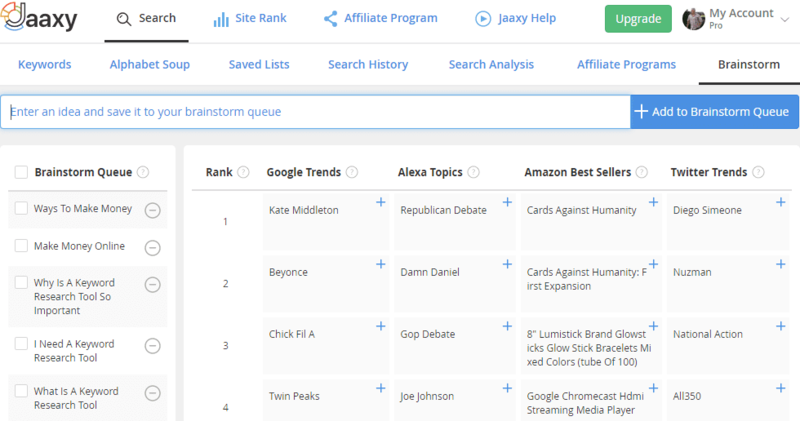 With the success of their flagship business and training platform then it only makes sense that a keyword research tool like Jaxxy would be so good. 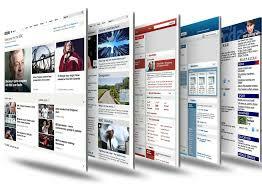 Jaaxy is a Keyword Research Tool that was designed and developed with total simplicity in mind. Anybody can master this tool in a very short time as it is not overcrowded with features that you don’t require, not like many Research Tools on the Internet today. Jaaxy will transform how you build your business, finding high traffic low competition keywords in seconds by using the data repository within Google and deciphering it in a way that everybody can understand. People who rely on Search Engine Optimization to drive traffic to their sites will find Jaaxy to be their best friend, and whilst it could take hours with other like-minded research tools to find a single keyword, Jaaxy finds it in seconds with many similar like keywords, along with an abundance of fresh ideas to help take your research further. Jaaxy is very easy to set up. No software downloads like many others, oh and I nearly forgot to mention, there are no Upsells either! Jaaxy comes with 4 membership levels and at a massively reduced price of which there are only 2 that you would need to pay for, but I’ll explain all that a little later on, and the Jaaxy membership would come with 3 bonuses too, so you won’t want to miss that. 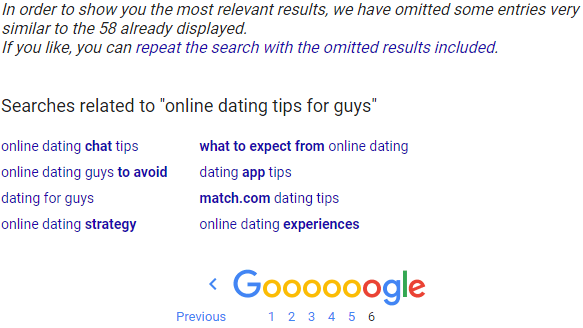 Google alone has some great functions to improve your keyword research and one of those is Google Instant which if you hadn’t noticed tries to predict keyword phrases when you type into the search engine, based on what millions of users are keying into the search engines. Jaaxy takes all of the millions of search phrases that people are keying into Google, Bing, and Yahoo and imports them into the Jaaxy database and uses sophisticated algorithms to bring all this data to you in a number of different formats that highlight many things about your target audience. What makes Jaaxy stand out above the rest? Let’s take a look at all the features in Jaaxy! Keywords Tab – The first thing you will see when you enter the Jaaxy application is the keywords tab, which of course is the main function of the app. Just enter your keyword and hit the “Find Keywords” tab and almost immediately you will have a number of keywords that best match your search criteria giving you a load of other keyword ideas for you to choose from. In the image below you can see the keyword query results with several columns which identify the strength of the keyword and whether its a keyword that we could use or not. 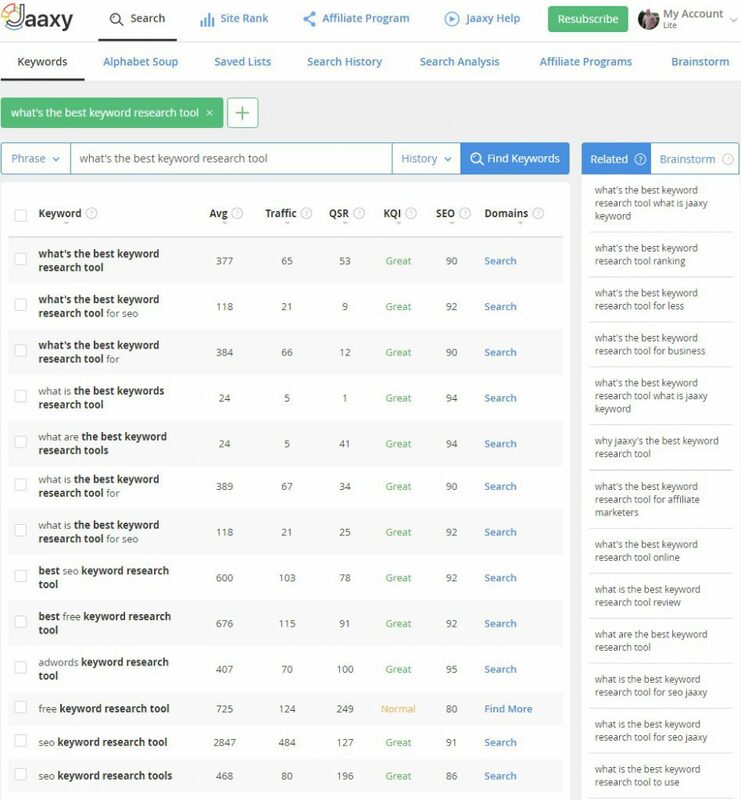 As you can see I have entered the keyword “what’s the best keyword research tool”, and below the image, we will discuss each column in detail to give you a better idea of how this can work for you. Here we have a list of keywords with our keyword that we keyed in at the top with a whole bunch of other different variations that we could research further and possibly use. You can sort by the column which helps tremendously especially with the 2 traffic fields and QSR because right at the bottom out of sight could be lurking a much better keyword with bags of traffic. To the right of each column, you can see a question mark (?). Just hover your mouse pointer over here to give you a description. Always get into a habit of sorting the columns, first to see what other great keywords there might be and of course, don’t forget that you can save them in a list to use at a later date. This is the average number of searches per month that the keyword in the list is keyed into the Google search engine. When determining whether the keyword we are researching is a good one or not you need to take this figure into consideration, and the bigger the number the better. This is the amount of traffic that could be available to you if you managed to get your post on the 1st page of Google. 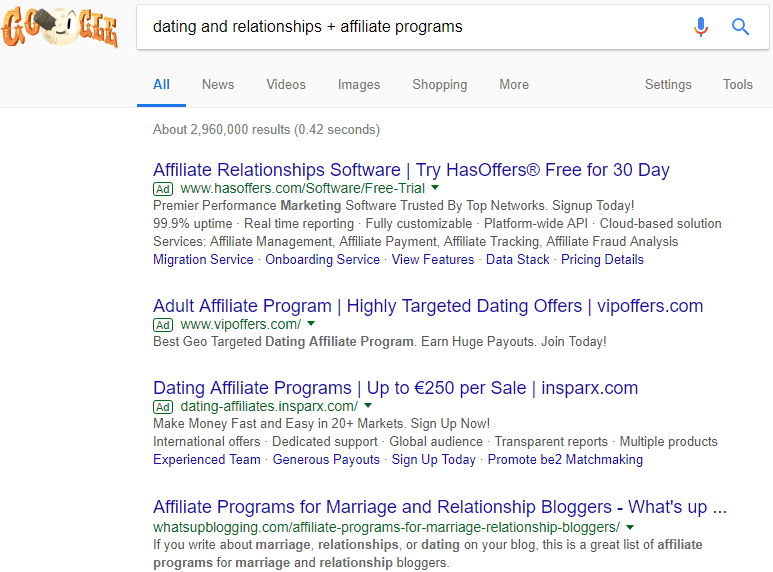 Probably the most important field which tells us how many website pages are competing for the same exact keyword phrase on Google. In other words, the number of web pages that have that exact keyword phrase included in the content. Jaaxy uses a state-of-the-art algorithm to determine the precise keyword competition within search engines to give you a reliable figure. The lower this number is the better and we are looking for a figure below 100. The lower the number the easier it will be to rank for in the search engines. But, remember that QSR can not work on its own, there still as to be a certain amount of traffic coming through to determine whether the keyword is one that we can use. Remember this Rule when Selecting a Keyword! Find a keyword that comes into the above equation and we have a potential keyword that we could use! Finding “QSR” in Google is a little long-winded – You need to include the keyword in double quotes (” “) enter and then scroll down to the last page of the search results. Now, this is probably not a good example because there is very little in the way of competition for this keyword, but if you had to try and do this manually then the keyword could have 100’s of pages to scroll down to. With Jaaxy we know this figure instantly! This feature gives us an indication of how good the keyword is. This figure is based on Avg, Traffic, QSR with some other factors and the colour coding is only in the Enterprise Membership. On the Pro and Lite membership, you get the text representation. 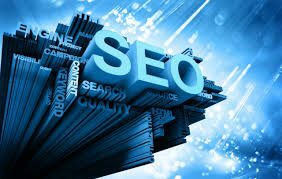 This statistical figure 0 – 100 with 100 being great, is based on traffic and competition (QSR) and a few other factors and indicates whether your keyword is good for SEO or not. In other words, how easier it will be to rank for in Google. 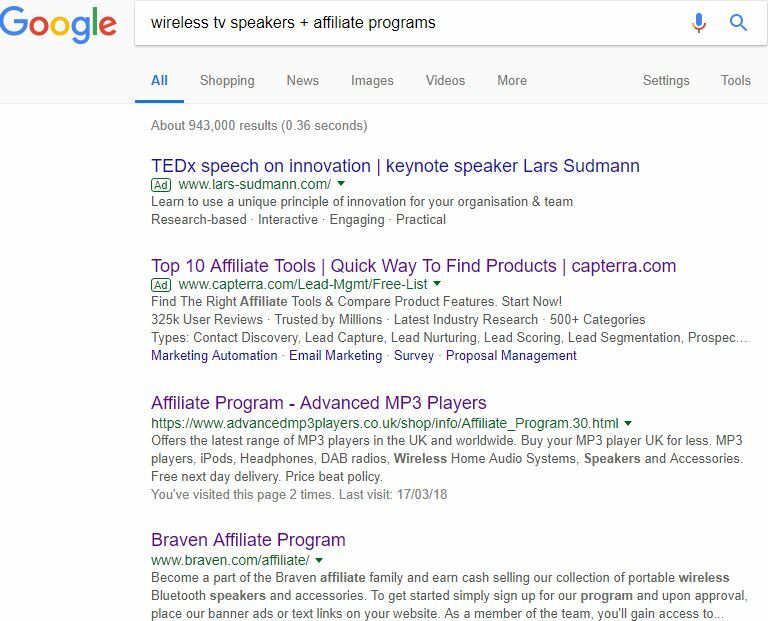 When researching what people are keying into Google and in the early stage of deciding on the type of niche to base your website around, then this feature at a glance shows you whether a domain exists for the keyword that you might want to use within the website name. Just think if you could use your main “Niche” keyword within your website domain name, this would help your website to show up in Google searches more, giving you a further boost in ranking. Every day we come across new keywords and keyword ideas and without writing them down they normally get lost, but not anymore because Jaaxy allows you to save them all in lists and stores them away for you. Before Jaaxy, I lost count of the number of times that I would come across potential keywords only to either forget about them or write them down somewhere only to lose the list. Now if I have an inkling that it could be a potential keyword I save it straight to a list and let Jaaxy look after it for me. Definitely a great habit to get into! Site Rank Tab –Trying to find out whether Google has ranked your recently published blog post used to be a difficult task, but that is all a thing of the past. Just type in your “keyword” for your article along with your “website” and hit the enter button and wait to see if your post is ranking high on Google. You can also set this function up automatically in the “Tracked Rankings” feature and let the Jaaxy keyword tool keep you informed. Just think about it, when you actually publish that great bit of content with that amazing keyword that you managed to find, it still takes time for Google to get its act together, not only to index your post but move it on up the rankings. Just add the details here and forget about it because Jaaxy won’t! Alphabet soup is similar to the “Google instant“, but Jaaxy goes one step further and automates the whole process by retrieving keyword ideas across the full alphabet range “A-Z” as you see in the image below. From here we can research the new keywords further by hitting the “Search on this” tab, or “Add” to the Brainstorm function to research at a later date. Jaaxy stores all your keywords locally in the keyword repository, where you are able to go back as and when to research them further or export them to your local hard-drive for further safe keeping. Here at a glance, you have all your own activity across the Jaaxy Keyword tool, all stored with the corresponding search types along with a timestamp. Can’t remember what you were researching a few days earlier, then just jump into the search history feature and see if Jaaxy can jog your memory. None of us as the capacity to remember everything we have done regarding keyword research, but Jaaxy can, instantly. Keep tabs on your competition with a little secret snooping, which didn’t do anybody any harm, did it? It’s always great to know who your competition is and what they are doing differently to you. This is how we improve and better our skills, by seeing how other more experienced marketers are doing things. 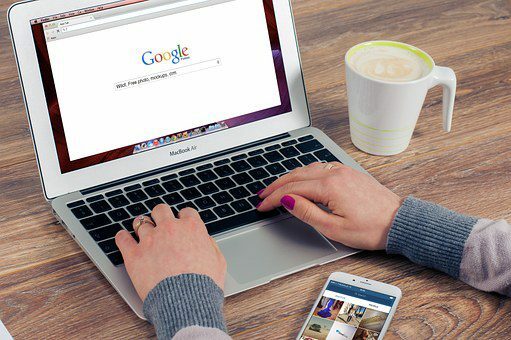 Here you can check out your competition for a specific keyword across the three main search engines, Google, Bing, and Yahoo, and displays the top 10 websites that are ranking for the keyword phrase entered. Go one step further and check out some important details to help you compete and better your current ranking. 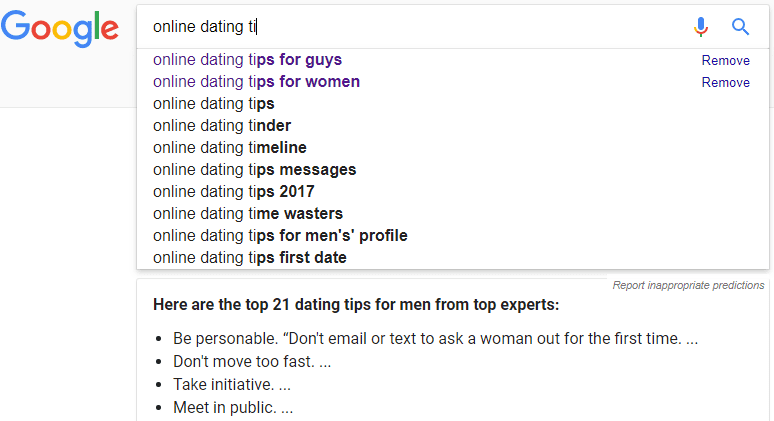 Google nowadays loves original, unique content and one way of competing and in some cases bettering your ranking over your competitor is by increasing the word count. 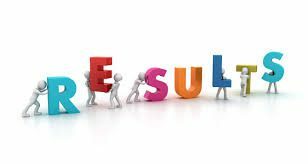 Obviously looking at the above example then you would struggle to rank higher due to the site been well established and with a ton of backlinks, but looking at newer sites with not as much authority and with 1000-2000 word articles, then ranking higher with more content is very possible. Looking for products to promote on your website, then just type your “Niche” into this feature and immediately in plain site are a number of products related. As you can see in the below image we have searched for products related to “photography” and displayed right in front of you are some products that you could use on your site. Even some products which are highlighted as high as 75% in commissions. Currently, there are 4 affiliate networks you can access through this Jaaxy feature, such as Clickbank, Commission Junction, Link Share, and Digital River and I understand there will be more added in the near future. 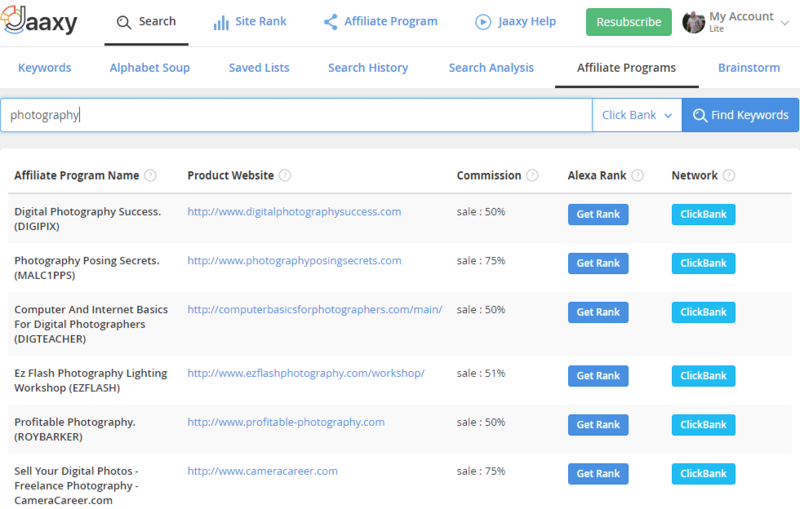 Of course, you could search out other affiliate programs yourself in Google by entering – Photography + affiliate programs if you wish, but all the same, I think its a great addition to Jaaxy. Ever wanted to know whats currently trending? Here you can, at a glance current trending topics across several platforms such as Google trends, Alexa, Amazon best sellers, and Twitter Trends. Just click and add them to your brainstorm queue for further research. Obviously, some trends come and go whilst others may be around for a while (possibly evergreen). You could take advantage of certain trends and write your content around them which would enable your post to get skyrocketed within the search engines for which you could certainly reap and benefit from. Help and the Jaaxy Bonuses to get you started! As part of the membership, you get 3 bonuses to help get you started along with several training videos, but to be honest all it should take to master the Jaaxy Keyword Tool is a couple of hours tops. As for help and support, if at all you ever need it, all I can say is that you won’t be waiting around for 24/48 hours. As soon as a support ticket is submitted you can expect a response within a couple of hours. Considering that there are thousands of members I think that’s pretty good and you won’t find any issues here. A Breakdown of the Jaaxy Pricing and what you get? 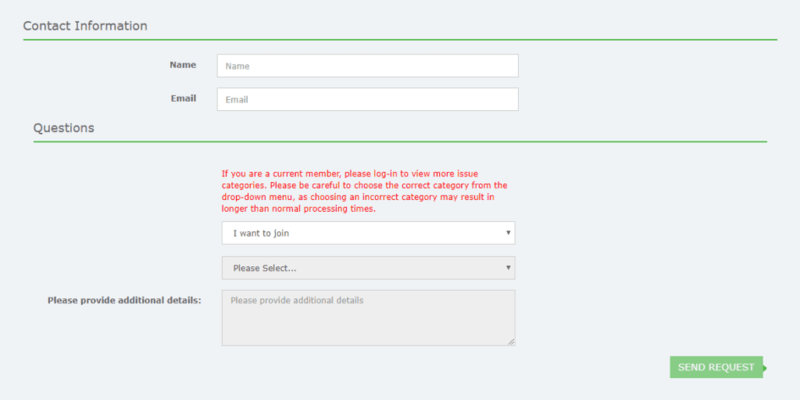 I think we have pretty much covered all the functionality within the Jaaxy Keyword Tool, and now all there is to do is explain the 4 membership options which are currently available. A great way to see if Jaaxy would be the right keyword research tool for you would be to take it for a free spin. It comes with 30 keyword searches, with 20 keywords in the results query, 2 saved keyword lists, 30 SiteRank Scans, 5 letter alphabet soup results, and Manual QSR. This should be more than enough to show what Jaaxy is capable of doing for you. You can check it out for free if you scroll to the bottom of this review or you could click here! 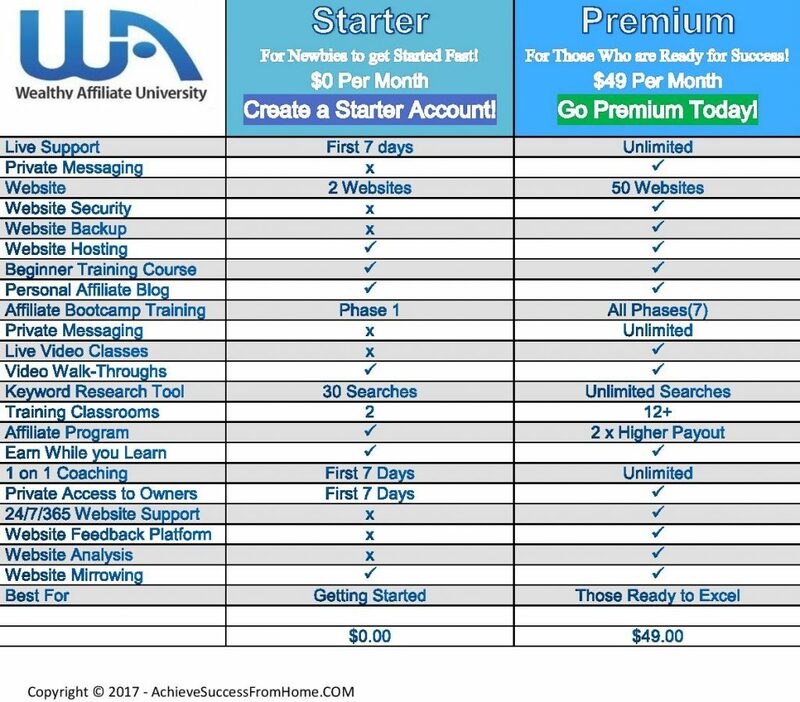 Jaaxy Lite, in my opinion, is the best cost effective membership option, which comes FREE and fully integrated into a training platform that teaches you how to maximize your success with it! I am a member of this training platform and since joining have had nothing but positive results and in my opinion probably the best training that you will find for building a successful business online. A one shop stop, where everything you would ever need to become an online success and remember I’d be there to guide you through the whole process. As a member of this training platform, this entitles you to some really big savings, beyond what it would cost if you joined directly through the Jaaxy website. This is currently around 50%. Jaaxy Pro is the most popular membership which costs $49/month going directly through the Jaaxy website, or only $19/month as a member of Wealthy Affiliate. That’s a saving of $360 over the year! 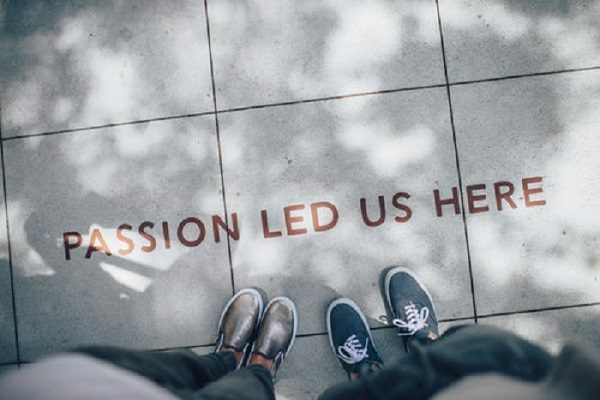 Jaaxy Enterprise gives you everything and costs $99/month going directly through the Jaaxy website, or $49/month as a member of Wealthy Affiliate. That’s a saving of $588 over the year! Prior to December 2017, you had to pay for, either Jaaxy Pro or Jaaxy Enterprise when becoming a Wealthy Affiliate member, but since then Jaaxy Lite has been included and comes FREE as part of the premium membership saving you hundreds of dollars. Why not give Jaaxy a try? Try Jaaxy for FREE and see what you think? 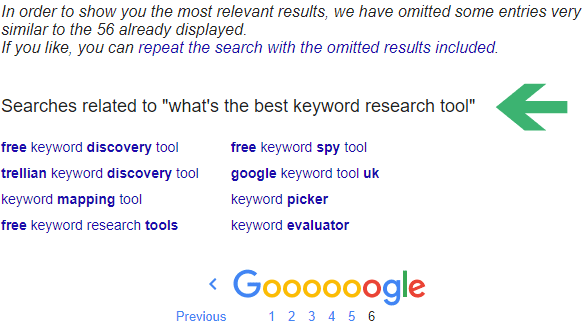 What’s the Best Keyword Research Tool for SEO – Final thoughts! Jaaxy was designed with the newbie in mind and coming from a software development background I can see that a lot of care has gone into this app to simplify and only give you what you would need, and isn’t crowded with complex functions like you see with many other keyword tools, which incidentally can be a lot more expensive. 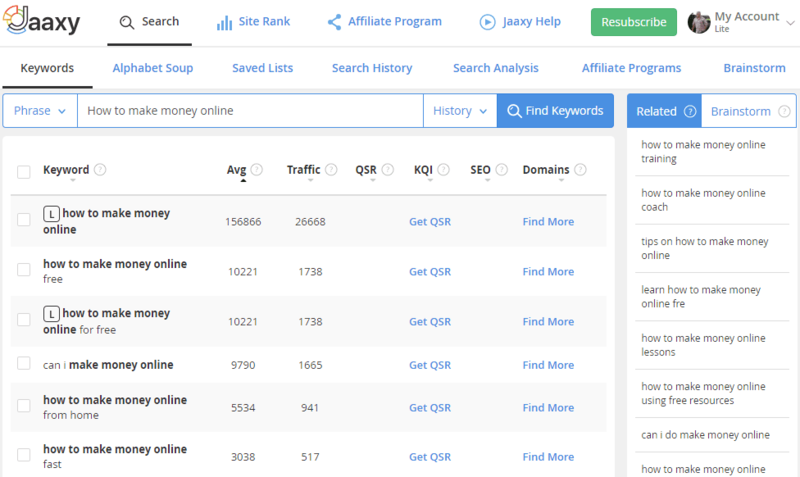 As far as I am concerned Jaaxy is the best SEO Keyword Research Tool that money can buy and I hope in this review that I have been able to show you this. I have managed to cover pretty much everything there is to know about Jaaxy, and hope that I have explained things clear enough in-order for you to make a decision one way or the other, but if I haven’t or you want some clarification then please let me know. If building an online business is something that you would be interested in then you can kill 2 birds with 1 stone and check out this amazing training platform that I am apart of along with Jaaxy all for FREE. Don’t worry I will be right by your side and give you 1 on 1 support. Did I manage to cover everything you needed to know about Jaaxy? If you enjoyed the review then why not share this amongst your friends? 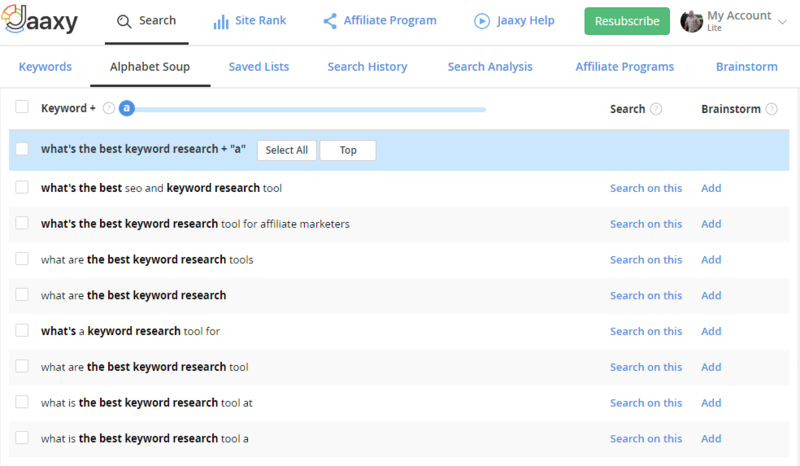 As far as keyword research analysis tools go, do you think Jaaxy is up there amongst the best? In your opinion, what’s the best keyword research tool for SEO? Feel free to share anything at all and I will surely get back to you. 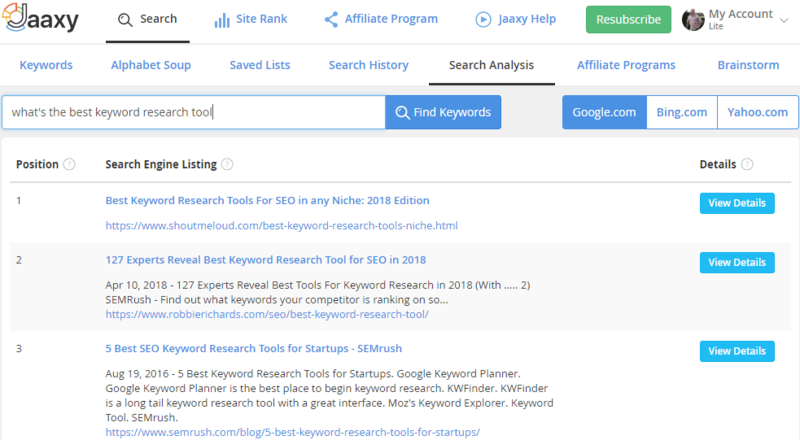 Author MickPosted on September 4, 2017 August 4, 2018 Categories Affiliate marketing, Keyword research, Recommended20 Comments on What’s the Best Keyword Research Tool for SEO that you can find in the Online Market Today? Is it Jaaxy?